Amazing Airfare Sale to Tahiti! Travel to the beautiful islands of French Polynesia is the holiday that dreams are made of. Now with Air Tahiti Nui’s special rate on air fare those dreams can come true! Rates start at just $898.00 per person roundtrip from Los Angeles to Papeete, Tahiti. This fare is not retroactive. 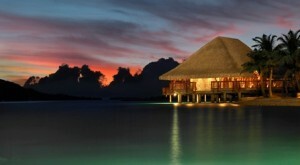 Tahiti ~ The word evokes visions of an island paradise. With 118 islands boasting high, rugged mountain peaks, coral reefs, turquoise-blue lagoons, white sand, palm-fringed beaches, and luxuriously intimate resorts, each island paradise has something for everyone. Bora Bora, Moorea, Huahine, Taha’a, Raiatea, Manihi, Tikehau, Rangiroa, Fakarava, The Marquesas and the other exquisite Islands of Tahiti cover more than two million square miles of the South Pacific Ocean and is comprised of 118 islands and atolls spread over five great archipelagos. Easier to travel to than you might imagine, Tahiti’s Faa’a International Airport is under 8 hours by air from Los Angeles (LAX) airport, with daily nonstop flights. As far south of the equator as Hawaii is north, Tahiti is halfway between California and Australia, on the same side of the International Date Line as North America, and in the same time zone as Hawaii (only three hours behind California from March to October and two hours behind California from November to March). Under a one hour flight from the island of Tahiti or Moorea, the island of Bora Bora, with a lagoon resembling an artist’s palette of blues and greens, is love at first sight. Romantics from around the world have laid claim to this island where the castle-like Mount Otemanu pierces the sky. Lush tropical slopes and valleys blossom with hibiscus, while palm-covered motu circle the illuminated lagoon like a delicate necklace. Perfect white-sand beaches give way to emerald waters where colored fish animate the coral gardens as they greet the giant manta rays. This could be easily be described as the center of the romantic universe, where luxury resorts and spas dot the island with overwater bungalows, thatched roof villas, and fabled ambience. Simply said, Bora Bora is the most beautiful island in the world. Pora Pora – the ancient name, meaning “first born,” came from legends describing this as the first island to rise when Taaroa, the supreme God, fished it out of the waters after the mythical creation of Havai’i, now known as Raiatea. Although the first letter “B” does not exist in the Tahitian language, when Captain Cook first heard the name he mistook the softened sound of the Tahitian “P” for “B” and called the island Bora Bora. Truly ~ the most romantic island in the world. From the dramatic scenery to the privacy and amenities of the overwater bungalows, everything in Bora Bora equals a 10 on the romance scale. Resorts have been welcoming couples for over 40 years and their special amenities have been fine tuned to perfection. From sunrise to sunset, each resort has designed their own blend of unique romantic experiences for their guests to choose from.